All of my life I have deeply loved books and libraries. As just a small boy, I remember how I felt when I first learned about the famous destruction of the Library of Alexandria in ancient times. What an inconceivable loss it was for humanity – setting us back perhaps a thousand years in terms of knowledge and progress. To my child’s mind, it was a horror: the unspeakable loss of all that knowledge and of the wonderful physical books themselves. It may have been the first time I felt an intense exasperation over senseless injustice caused by the actions of ignorant people – something that still manifests in the modern world. I know now that whether human caused or the result of natural disasters, all collections of knowledge are vulnerable to eventual destruction, especially the individually curated and conserved libraries that we carry around with us through our lives: our personal knowledge and experiences, our stories, our memories, and our philosophies. Each of us contains an amazingly vast repository of these things, and the human brain is still the most complex object known to exist in the universe. As we know too well, however, we are individually subject to dangers and death, and even if we live a full life, natural death will eventually close our library forever. 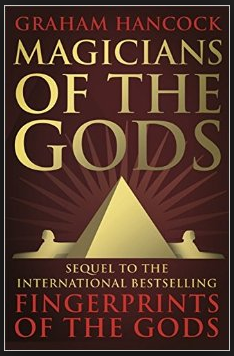 In a strangely real sense, every person is a Library of Alexandria, doomed to destruction. I felt this quite personally when I was trying to record my Mother’s knowledge about a large collection of family photographs that range back into the 1800’s. Without her memories, many of these will become disassociated from their personal stories and history and flatten into what so many old photographs are: just an old, vintage photo. It saddens me to see such family images for sale in antique stores. Someone’s family heritage and history was lost. Their library “burned down” and there is no way now to recover the information. We can only look into the eyes of that long-passed person and wonder. There are thousands of such images in my family library and I wanted to preserve as much information as possible, so I began recording my Mother, who was happy to help until her health failed and we had to stop. Now, the opportunity has passed and, as much as my sisters and I may remember of it all, there is yet a large, deeper mass of information that has been lost permanently. That is just one family and one person’s passing. How many billions of such libraries have perished? It boggles the mind to consider it and to imagine what has been lost along the way. Writing, itself, is a human invention designed to transmit information over time and space, but it cannot contain all that might be recorded. With our modern electronic technologies, many are trying to address this issue by preserving not only books, but other forms of history and knowledge, including digital data, sound recordings, and photographs. Perhaps it will survive, but there are many who warn that our digital data is more vulnerable than the papyrus scrolls were, stacked in their racks in Alexandria. Perhaps some remote and massively secured vaults will protect some of it for a far future, but will anyone be able to make the ancient machinery work, or themselves make new machines that can access and display the data? Will future historians look upon our time as a sudden blank in history because all of our stories and information went into a technical form that cannot be retrieved? I wonder. When we look back on ancient lands like Egypt, we should realize that 3,000 years ago is not so far back in time, really. Now, the papyri and the painted tombs are fragile and rare, deteriorating with every year that passes. What seems to stand the test of time best is the simplest and, some might think, most primitive technology: engravings into stone. In Egypt and other lands that so carved, even these records are shattered, chipped, scattered, and represent incomplete versions of their original states. It is disconcerting to realize that modern man has left comparatively little of our thoughts carved into simple stone. So, in the end, even if that end is a far off future where our civilizations are as murky as Egypt’s or as vague and mythical as Atlantis, does it really matter? Should we be concerned, or try to make a deeper, more lasting mark that may, somehow, survive for our unknown future children? Yes, some are trying to archive and store mankind’s knowledge and they may succeed to some degree, but it is likely that most of it will be lost over vast ranges of deep time. We may, indeed, be living in a future time’s Atlantis – our reality a mythological place to those future kin. Ours a human world that may have existed in some form but can’t be proven. A dream out of Time. In the final analysis, we cannot truly save our worlds. All is in constant motion and does not return again to the same place. Those that come later will have their own world and will not have time to relive ours, even if some of our knowledge may be useful to them, either as practical knowledge or, perhaps, as a warning of what to avoid. These are melancholy thoughts, and for the majority of us, probably best considered once and then left behind as we pursue our own individual life paths. Perhaps, though, and at a personal scale again, we should at least think about preparing for our own Library to burn down someday and spend some of our time documenting the contents that we think our families, at least, might want to know later on. We shall not be able to hold on to all we love, and that is just a part of how life is, but some in the future may truly desire to have even a small portion of what we know. I still wish I could have documented more of my family photographs with Mom before she was gone, and I still remember that little boy I once was and how deeply and personally hurt I felt at learning of the loss of the Library of Alexandria – something that happened some 2,000 years before I was born. We may honor the past and future or desire them greatly, but we cannot live there. It is useful to remember that we honor and desire them in the present moment. All that truly exists is NOW. A photography post for this hot summer’s day. Here are some of my images from my last journey into an amazing landscape in southeastern Utah. Please click on any photo for a larger, better view. I will be heading back into this area this fall to do some more photography and cinematography and I will look forward to sharing some of that with you then. This is Chesler Park, part of the Needles District of Canyonlands National Park. It’s a very special place I’ve repeatedly visited since 1975. Entering this land, we feel like we have stumbled into a giant, ancient, Atlantisian cityscape – thousands of massive buildings, scatter far over the rolling hills and loom profoundly next to our tiny forms. They are frozen in time as the wind and sun slowly melt the magnificent masonry into curious shapes. Long, inspiring parks of green and orange still echo the aesthetic design of a masterful and artistic urban planner. It is a scene that seems populated or that seems it should be – filled with milling crowds. When the black raven caws and the wind sighs around the rocks, however, we realize that it is too quiet for such crowds. There are few humans here. The rock pillars themselves form the sense of mass congregation. Perhaps it is all mere sand and wind. Perhaps. As we stand, dwarfed, by a reddened wall topped with curious minarets and colorful balanced spires, we may sense that this primordial cityscape was designed this very way by spirit beings or unknowable men and women of mystic vision, serving some need of the soul and heart that still resonates in us today. We feel the rocks ringing and singing their long songs, gazing ever into eternity. Spirit hand prints of the Ancestral Puebloans who passed this way some 500 to 900 years ago. With time so long and slow in this magical land, it seems that the red paint should still be wet to the touch. You can hear Time pass by in a soft and curious breeze between the painted walls. Meet K’ak’ Tiliw Chan Yopaat, or in our best interpretation of his name: Kawak Sky. Time for a travel post and photos. Whenever I’m not focused primarily on landscapes and scenery, travel for me often involves ancient cultures and archeological sites. I’ve been scanning some of my older photo collections, and these images from the Mayan site called Quiriguá came up today. Quiriguá (our modern name for it) is a modest Mayan site in terms of architecture, but its collection of carved stelae and zoomorph stones are amazing. Quiriguá lies in southern Guatemala, not far from its large rival city, Copán, just across the modern border to Honduras. It was declared a UNESCO World Heritage Site in 1981. Quiriguá was the first Mayan site I had the privilege to visit, and it was a good introduction to the Mayan world. Kawak Sky was the “k’ul ahaw,” or “Holy Lord” of Quiriguá. This small city was active during the Maya Classic Period from about 200 to 900 AD, and is noted now for its important carved stone monuments. These represent the most dense collection of Mayan hieroglyphic stone stelae known to exist in one site, and the tallest freestanding stone monuments in the Americas. Stela E stands 35 feet high. The local red sandstone is solid and clear of fractures, which allowed the Mayan artisans to carve deeply and in large format. 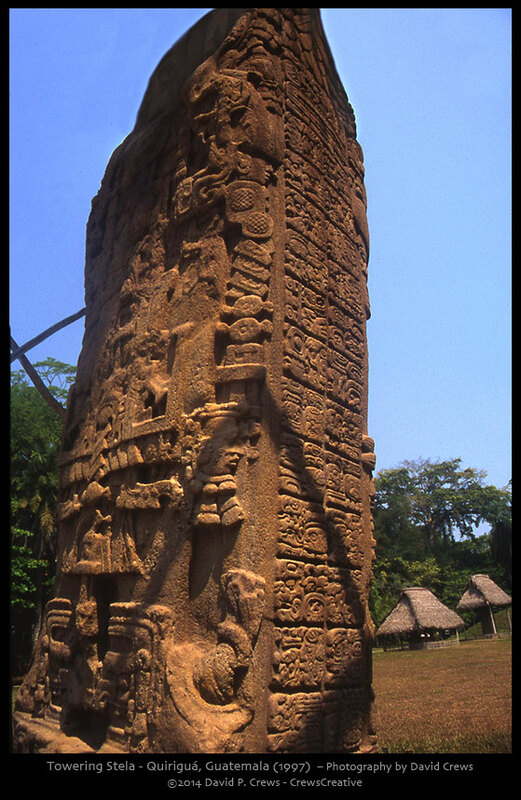 Quiriguá was a subservient city to the much larger and more powerful Copán until Kawak Sky managed to ambush the elder king of Copán and haul him back to Quiriguá for a ritual execution. This occurred in 738 AD, establishing the independence of Quiriguá from that time forward and making Kawak Sky the most celebrated of its rulers. It was fascinating to walk for my first time among ancient Mayan carvings and see a real ball court. At that time, I was recently married and we enjoyed climbing the carved stone steps of the central acropolis and listening to the forest birds as we soaked in the strange air of this place. It’s history, often very violent, was so different from our own culture. Yet here it lies, surprisingly close in physical distance to my own home in Texas. I’ve been to a number of other Mayan sites since this, but I never tire of the sense of wonder and history one experiences when actually walking these old cities and monuments. Huxley, Aldous (1950) [©1934]. 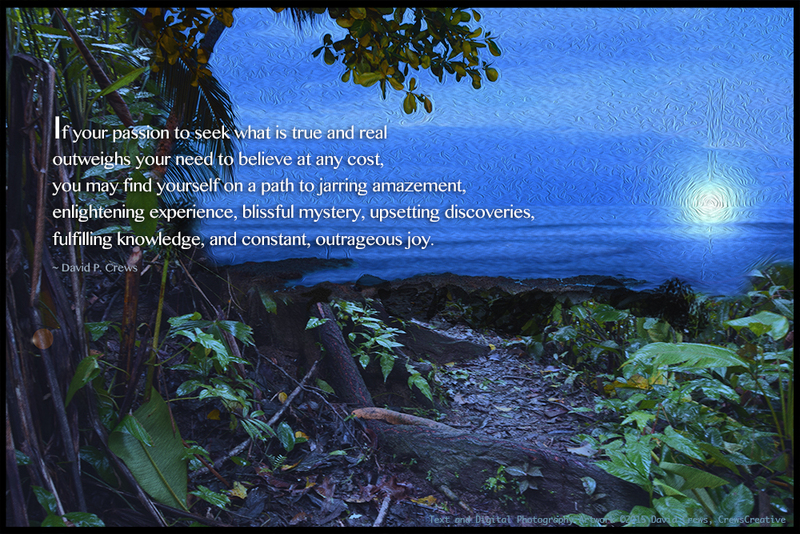 Beyond the Mexique Bay: A Traveller’s Journal (Reprint ed.). London: Chatto & Windus. Perhaps, as we gaze into the bright blackness of space, we may come to consider a compelling idea: that the portals and pathways to other worlds are not necessarily paths of simple distance or simply-ticking time. Perhaps, the portals we seek are of a different fabric and shape. It may be that they are not far away, not far away at all, though we think them unreachable except in our fantasies and myths. These endless other realities could be only a strange but simple turn away, just one small turn into a passage that we did not see, even though it was there next to our chair all along. A new poem and artwork today. It speaks of unfathomed dimension and scale in the human mind and soul. Oh so many, glowing here and there? Tiny swirls of light and bone? Our mind looks out of. Step within to see the trick. Each the color of a memory. Renewed by loved lands and faces. Worlds we did not plan. Our galaxy is so vast. And sing the strands of Life.